11 a.m. — A roundup of fires in the Yukon Flats area that have updated information from Saturday. 07/11 Saturday: The fire is approximately 5.5 miles east of the Dalton Highway near MP 91. Road updates are available on 511.alaska.gov. There is no new update on acreage or fire activity. 07/10 Friday: Fire activity was minimal with creeping and backing reported. Recent rains have helped keep fire spread to a minimum. Fire spread is expected on the west and SW portions of the perimeter. Increase in acreage reflects more accurate mapping. Fire is in monitor status. 07/09 Thursday: Reconnaissance reported the fire to be smoldering and 30 percent active on the south side and 20 percent active on the northwest side. The fire remains in monitor status. 07/08 Wednesday: No new update. 07/07 Tuesday: No new update. 07/06 Monday: An increase of 5,708.9 acres was reported. 07/05 Sunday: Reconnaissance reported the fire to be 80% active with backing, running, torching, and continuous crowning. Fire is in monitor status. #735 Suter Creek: 160 acres. Discovered on 7/11/15. Approximately 30 miles west/northwest of Eagle. 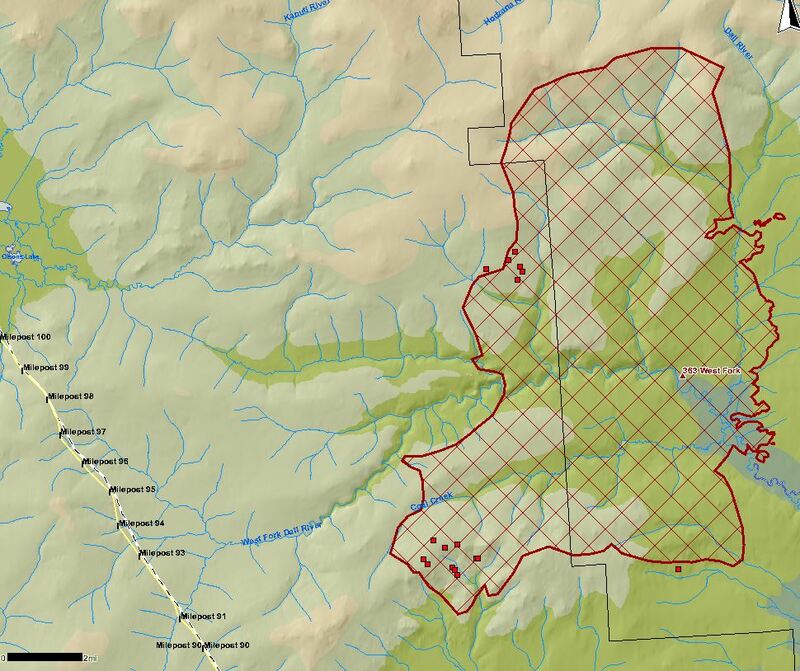 7/11 Saturday: New fire that was reported as 160 acres, burning in white spruce and tundra. It was 40% active. Fire is in monitor status. 07/11 Saturday: Fire behavior was minimal with smoldering reported. The Fort Yukon #1 crew continues to work the south flank where there is interior heat. 07/10 Friday: A new helispot was added on the fire. The southwest perimeter is the current area of focus. The Fort Yukon #1 Crew continues to staff the fire. 07/09 Thursday: Fire behavior was minimal with smoldering reported. Winds on Monday night pushed the northwest and southwest corners of the fire to the northwest for an additional 1,000 acres. The fire received 1/5 inches of rain on Wednesday, so minimal spread is expected. Some overhead swapping occurred Thursday. There were nine additional jumpers were put on the fire. The fire was reconned today and only a couple smokes were showing on the interior. Resources are working to secure the southern flank. The Fort Yukon Crew is working the east side while smokejumpers are securing the southern flank to prevent the fire from threatening Chalkyitsik. 07/08 Wednesday: Fire behavior was minimal with creeping and smoldering reported. The fire is 40 percent contained. The containment lines are expected to hold and no significant growth is expected. The transition of Incident Commanders is planned. 07/07 Tuesday: Firefighters continued mop-up operations. Fire activity did increase on Monday due to winds, high temps, and low relative humidities. The fire received 2 inches of rain on Tuesday. There is very low visibility because of smoke around the fire making resupply for the firefighters difficult. 07/06 Monday: Fire activity picked up in the evening with a wind change. Growth is expected to the southwest. Firefighters continue to reinforce containment lines. 07/05 Sunday: Fire was active Sunday with crowning, running, and smoldering reported. Crews made good progress on both flanks, even though there were flare-ups on both the northwest side and the east side. There is no significant growth expected. 07/11 Saturday: The fire was flown and was found to be 0% active with no smoke showing. It remains in monitor status. No acreage change was reported. 07/10 Friday: No new update. 07/09 Thursday: An increase of 209.2 acres was reported. 07/06 Monday: Two MODIS dots indicating activity on this fire were discovered via satellite. The fire was mistakenly declared out on 6/30. A reconnaissance mission will fly the fire for an update. 07/11 Saturday: The fire was flown and had a 10% active perimeter that included backing, smoldering, and burning in white spruce. Fire is in monitor status. 07/09 Thursday: No new update. 07/06 Monday: No new update. 07/05 Sunday: No new update.